A simple method to root L710VPUDND8 Android 4.4.2 KitKat Firmware is now available at NasirTech. Samsung Galaxy S3 SPH-L710 (Sprint USA) recently get updated to the L710VPUDND8 4.4.2 KitKat Firmware. If you yet to update the firmware, then update the same by following this link- L710VPUDND8 Android 4.4.2 KitKat Firmware for Sprint Galaxy S3 LTE SPH-L710- How to Install. Hope you updated this latest firmware on your device and now you can root the same using our simple tutorial below. The below guide will help you to root VPUDND8 4.4.2 KitKat Firmware running on Galaxy S3 SPH-L710. Continue reading the tutorial for complete guide. So, want to root Galaxy S3 SPH-L710 Running L710VPUDND8 4.4.2 KitKat Firmware? Continue reading this page to get all the necessary steps to successfully root your device. The root file (CF-Auto-Root) we used in this tutorial is safe and have nearly 100% success rate. We'll use Odin software to flash the root file. All the above pre-requisites are very important and must be followed before proceed to installation guide. Hope you get all the above points and done as mentioned. Now, you are ready to move to the final step of this tutorial where we have arranged a step by step details guide to root Galaxy S3 SPH-L710 running L710VPUDND8 4.4.2 KitKat firmware. Now, click on the AP button and select the CF-Auto-Root-d2spr-d2spr-sphl710.tar.md5 file. Congrats! You have completed the tutorial to root Galaxy S3 L710 running L710VPUDND8 4.4.2 KitKat Firmware. Hope you successfully done the rooting process. 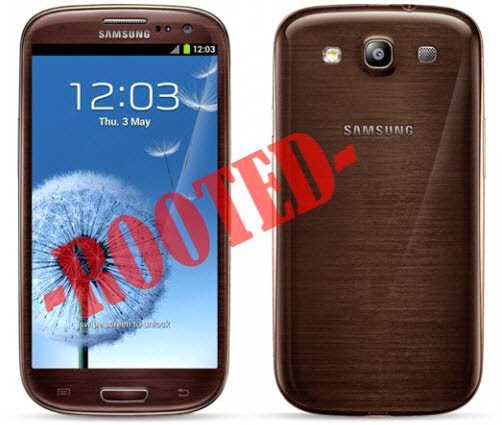 If you followed everything as mentioned in the above tutorial, then your Galaxy S3 L710 should now rooted and you have complete control over your device. Now, install apps that ask root permission or flash various custom ROMs. To verify your device is rooted or not, you can download and run the Root Checker App from Google Play Store. If you have any doubt or query about the tutorial, feel free to contact with us using the comment form below, and share your rooting experience with us. Will this method also unlock the bootloader and wipe the phone? I plan to keep the stock rom and do not require that the bootloader be unlocked. I only need root access and do not need to wipe the phone. I have tried this with a Sprint Samsung G3, SPH-L710, Android 4.2.2 (auto download from Sprint, L710VPUDND8. Doesn't work. Sorry, This device does not have proper root access. I've tried with my normal setting, then tried again after removing the microSD and doing a factory reset. Same results. Update to my May 30th post. I finally did get it to work on the Sprint Samsung GS3. When I rooted the phone back when it had 4.1 and 4.2, I copied on a SuperUser.zip and had a recovery ROM that allowed me to install SuperSU (an old free version) which rooted it and then I could do an update to the newest version via the App Store. However, this time that didn't work. I not only had to uninstall SuperSU and SuperSU Pro before trying to root 4.4, but I had to delete the SuperUser.zip off my internal SD card, and THEN try re-rooting. Maybe that wasn't what did it, but it did eventually work after I did that. Strangely, I didn't delete SuperUser.zip when I rooted 4.3 using this exact same method and it still worked, so who knows? I can verify that the method above did work on my GS3, SPH-L710. However, after reboot, I also got the message that SuperSU had stopped. I checked and it was installed. So I went and updated SuperSU to the latest version (v1.94) via the market. I then went to SuperSU settings and installed it into the system and rebooted. I now had root access and SuperSU is now running properly. Tried it, didn't work, got the same results as Chad. Rooting for versions 4.1, 4.2, and 4.3 had worked in the past. I had SuperSU and SuperSU Pro installed previously, and it said that neither were installed afterwards. I reinstalled them, and SuperSU said that it couldn't run, was missing the binary and couldn't install it. So I uninstalled both, repeated all these steps here, it still did not put SuperSU on it nor root it according to Root Checker. I have Sprint. I've heard various carriers tweak their ROMs to disallow rooting using current methods. What does the author of this article use? Tried it several times. No luck. Does not root. Any way to root? I was rooted. Went back to get update. Now I regret it.